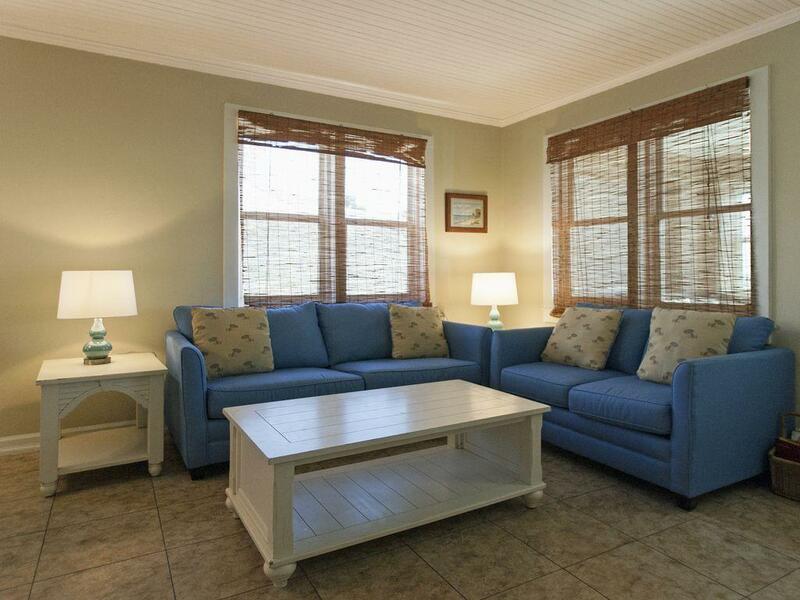 The Outpost Gulf-front beach house is a quaint, 4 bedroom, 3.5 bath cottage that sleeps 12. 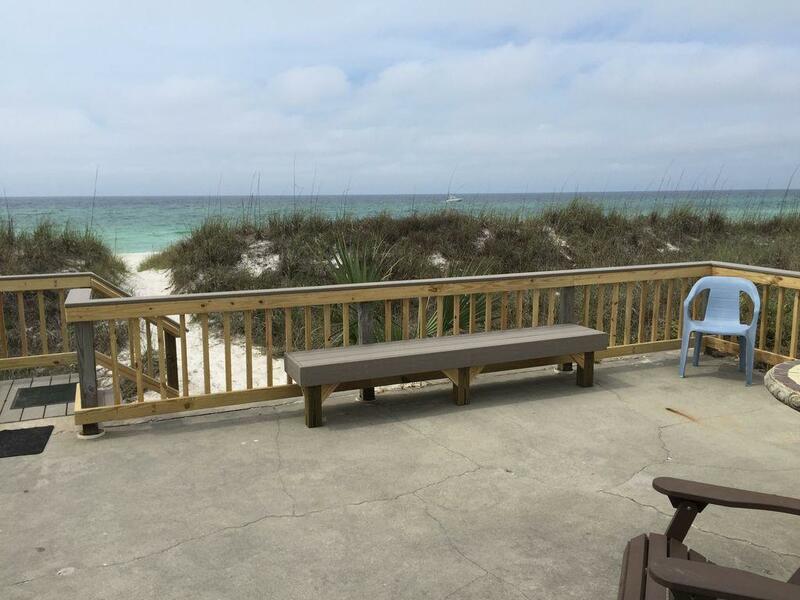 This Panama City Beach location is ideal and the beach and Gulf views behind the house are spectacular. In response to some of the reviews last year, large improvements have been made to the house. 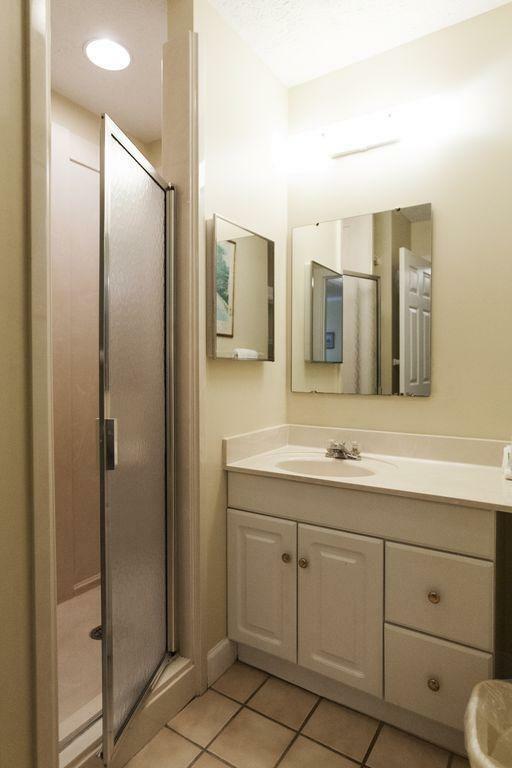 We replaced all the floor coverings, painted the entire interior, replaced all the kitchen cabinet doors, replaced much of the furniture, replaced all the bed covers, installed new window shades, and replaced all the exterior doors. Last spring, we replaced the exterior siding and painted the entire exterior. 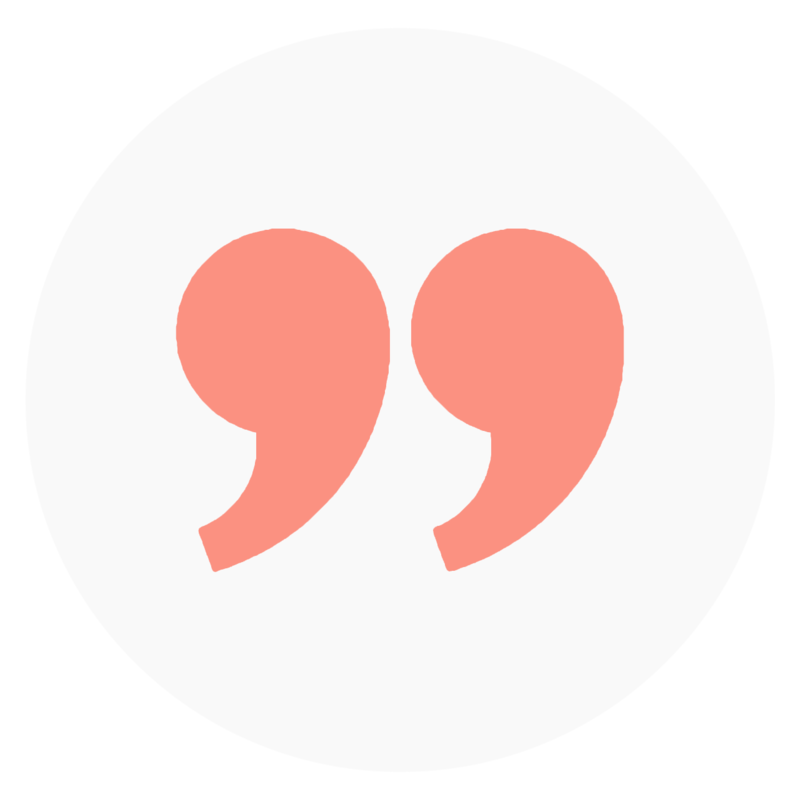 The concerns that some of our guests expressed last year will no longer be an issue. The improvements have made a remarkable difference. The Outpost has two separate living spaces. 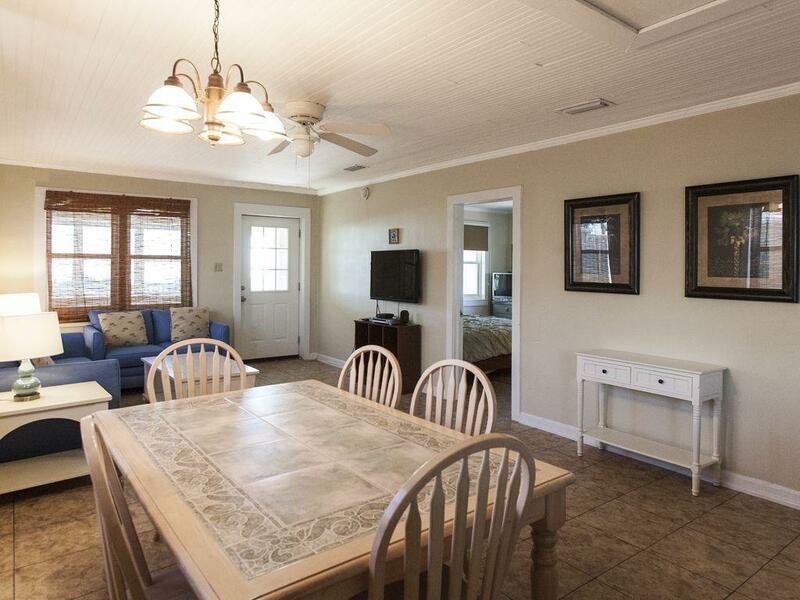 The main part of the house sleeps up to 10 and consists of the living room, dining room, kitchen, master bedroom (king) with private bathroom, a guest bedroom with two full beds and an attached bathroom, and a Florida room with two day beds which is ideal for kids. There is also a queen sofa sleeper in the living room. 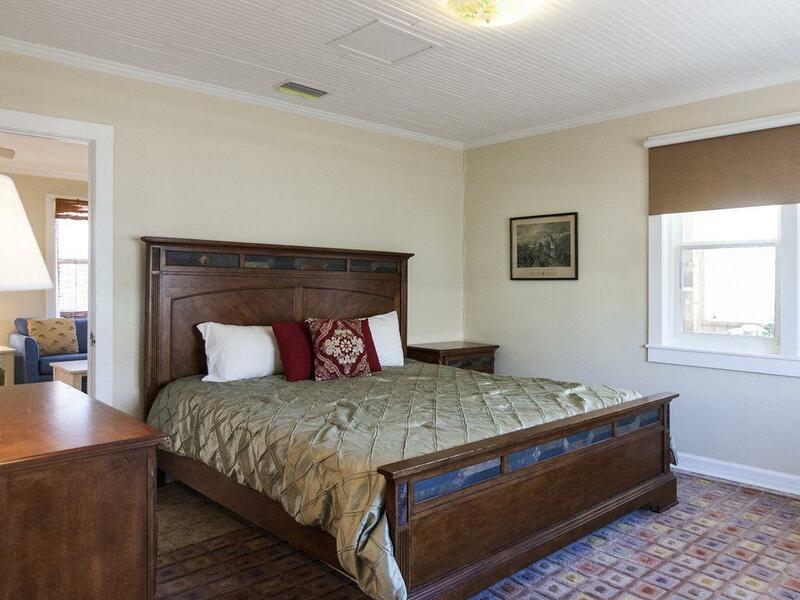 The other two guest bedrooms are separate from the main house but are connected under the same roof (access is through an exterior breezeway). 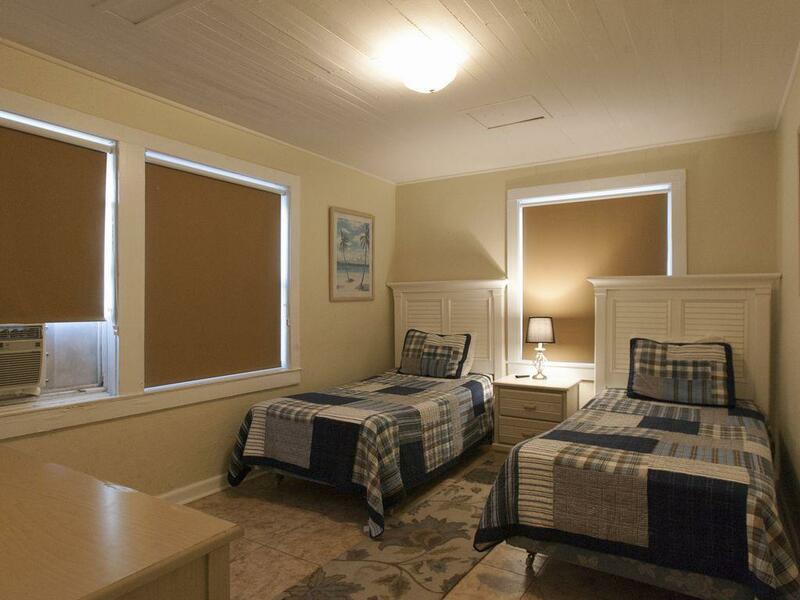 One of these bedrooms has two twin beds and a full private bathroom. It is ideal for the in-laws or older children. 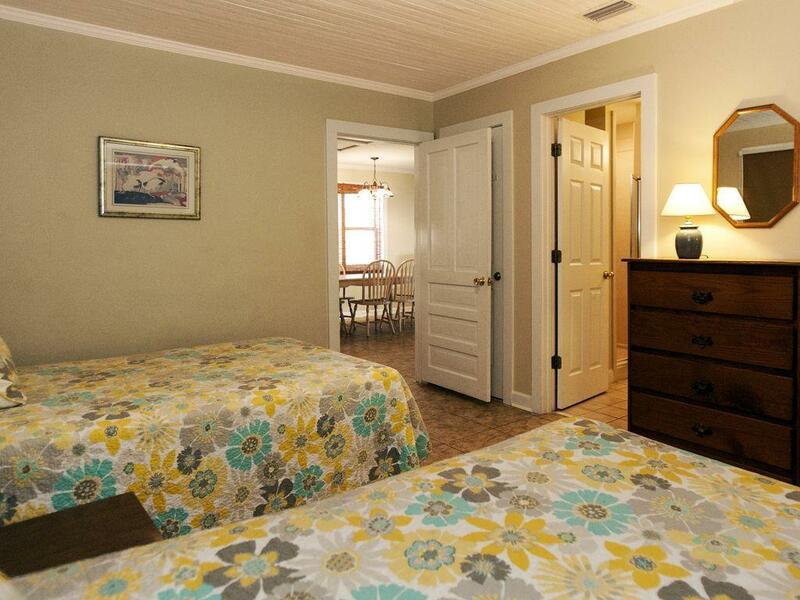 The other guest bedroom has a full bed and a half bath which is accessible from the breezeway. 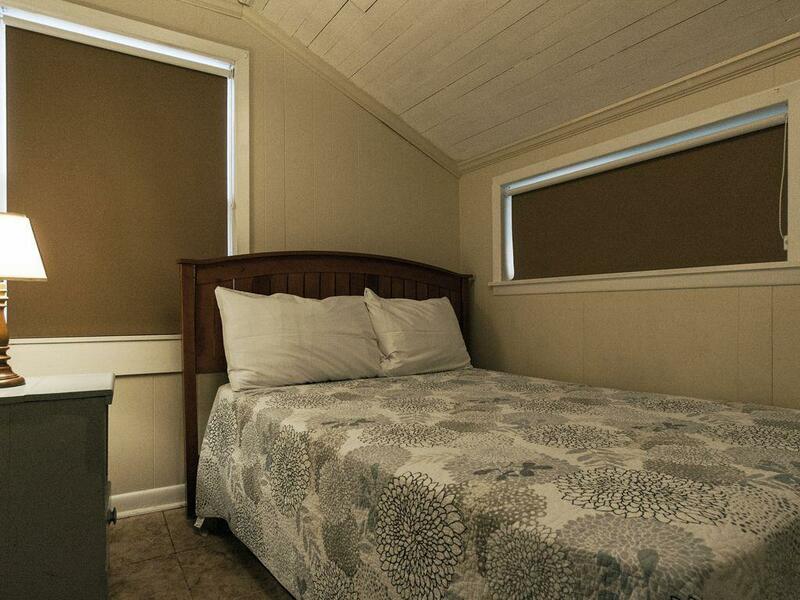 *Because these bedrooms are not inside the main part of the house, we do not recommend them for small children. The living room includes a new flat screen LCD TV (not shown in pictures). The kitchen is fully stocked with everything you need to prepare and serve meals. 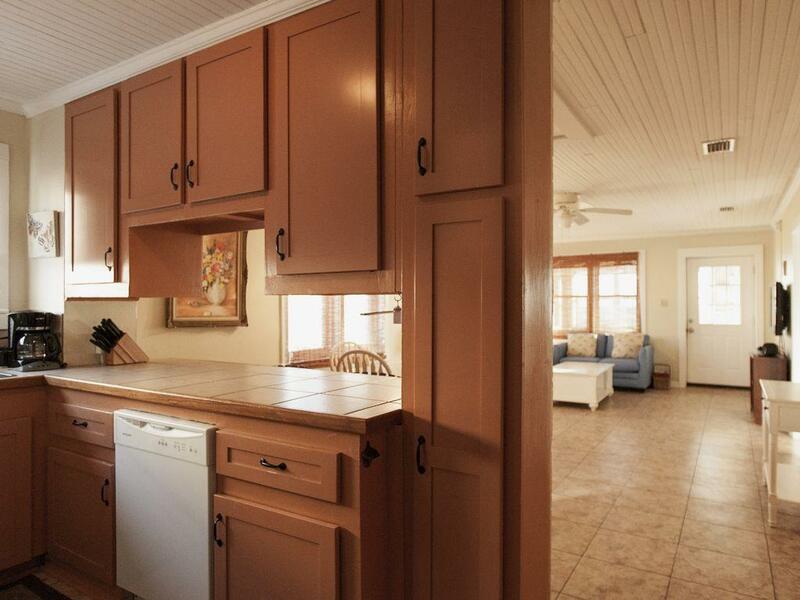 The dishwasher and refrigerator were recently replaced and the counter tops were recently resurfaced. 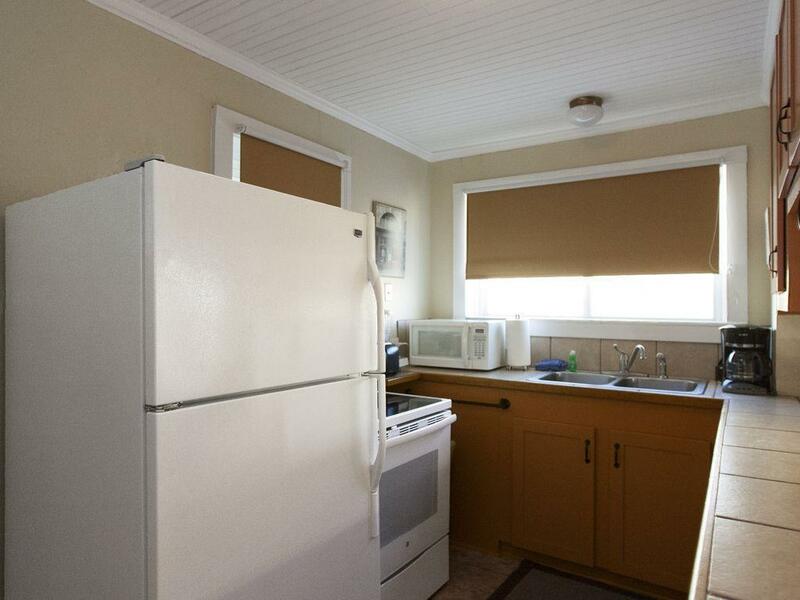 It is not a gourmet kitchen, but includes all the essential appliances, cookware, and utensils. We have Wi-Fi with unlimited service. There is parking for up to 4 vehicles. 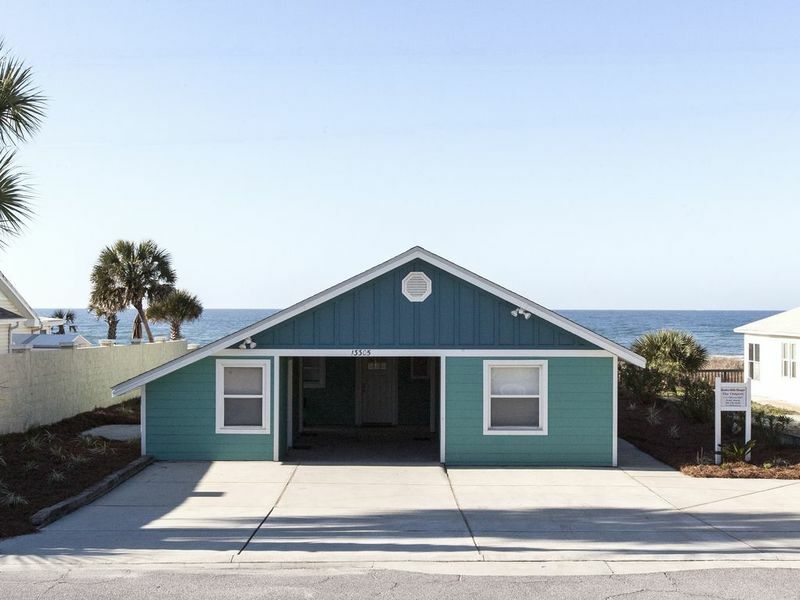 If you are looking for a beach getaway without all the frills, pretense, and expense of a 5 star resort, choose The Outpost and come relax with us! The house and accommodations were just what we needed but it's all about the location. Not a fancy place but very comfortable. The recent upgrades are very nice and well done. The weather was perfect as well. Thanks for arranging that! We'll definitely be back. Bedroom 3: 1 full bed, accessed from Breezeway. Not part of the main house. 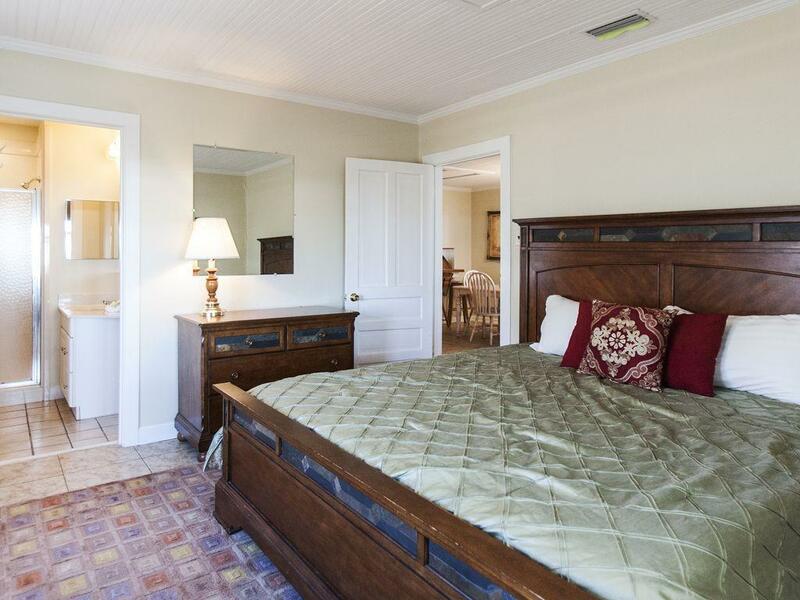 Bedroom 4: 2 twin beds, TV, attached bath, accessed from Breezeway.Not part of the main house. The location of this property is everything!! 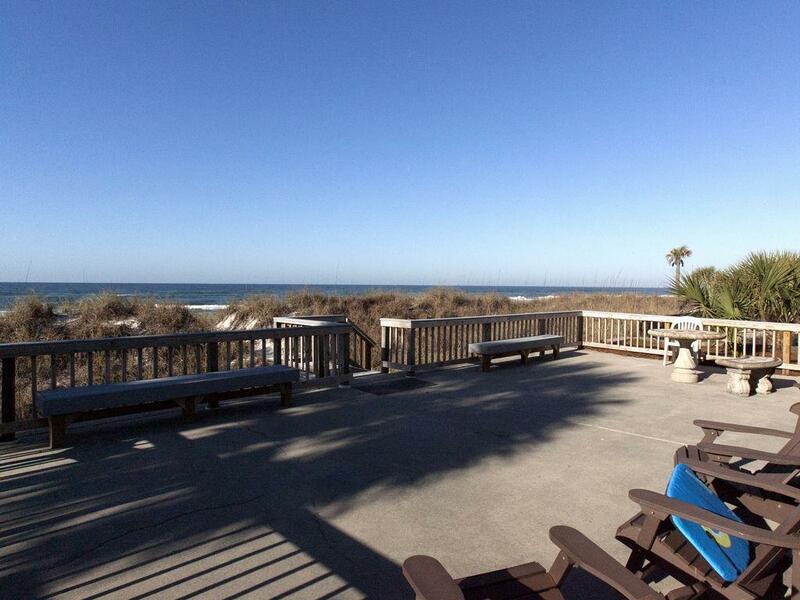 Step off the back porch into the sand!! 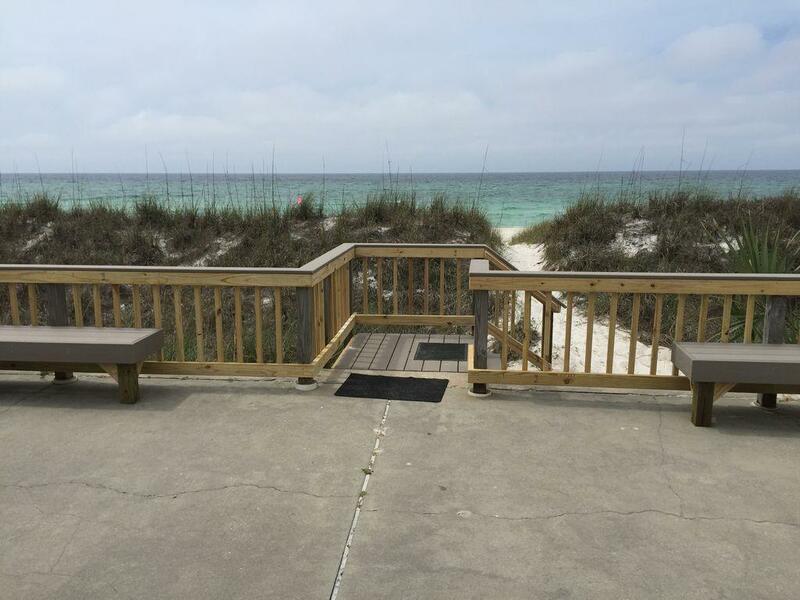 Stepping off the back porch into the sand is what were were looking for!! We were not disappointed in that!! The house itself is an older, remodeled house, so it is what it is. 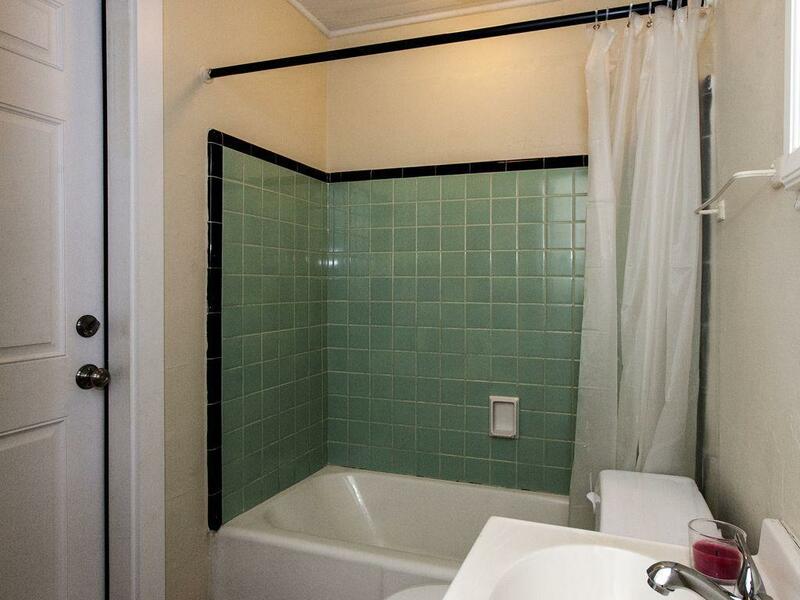 And it's not a new, modern condo with resort amenities; so if that's what you're looking for, this is not it. But, the trade-off is the location...right on the beach...the non-crowded beach...and the privacy afforded by it being a single-dwelling, surrounded by other single-dwellings! It's also very close to all the shops and activities the younger ones in our crowd enjoy. Back to the house itself...even with it being older, it still had everything we needed and plenty of space for our party of eight. 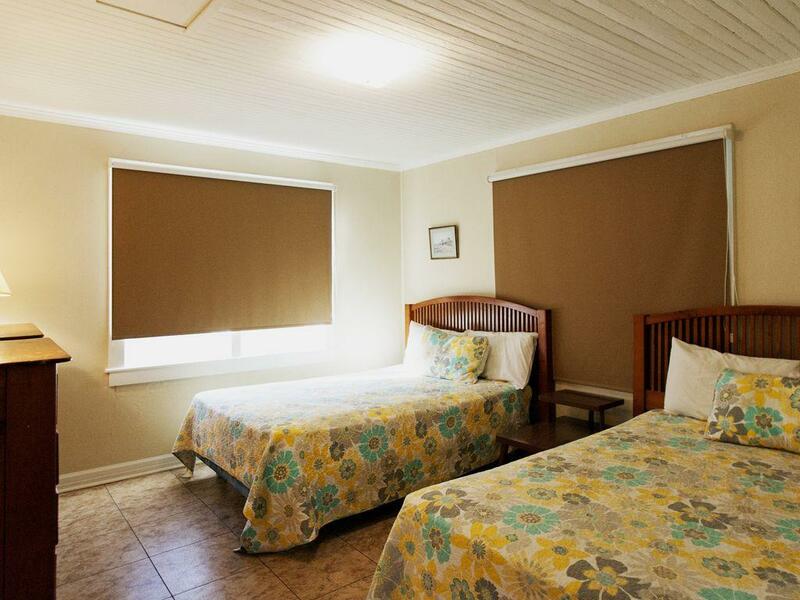 The furnishings are very comfortable, and appliances and air conditioning are new and all worked very well. There is plenty of space to park 3 cars. One of the BIG pluses in my book is the fact that we had a Property Manager, Michael, who worked with us prior to our traveling, and then met us at the house upon arrival to show us the important things about the house. He was also available to us during the week; however, we experienced no problems, so we did not have to call on him. Michael was super nice, as was his co-worker Ashley, who is in training. They both made us feel very welcome and comfortable. 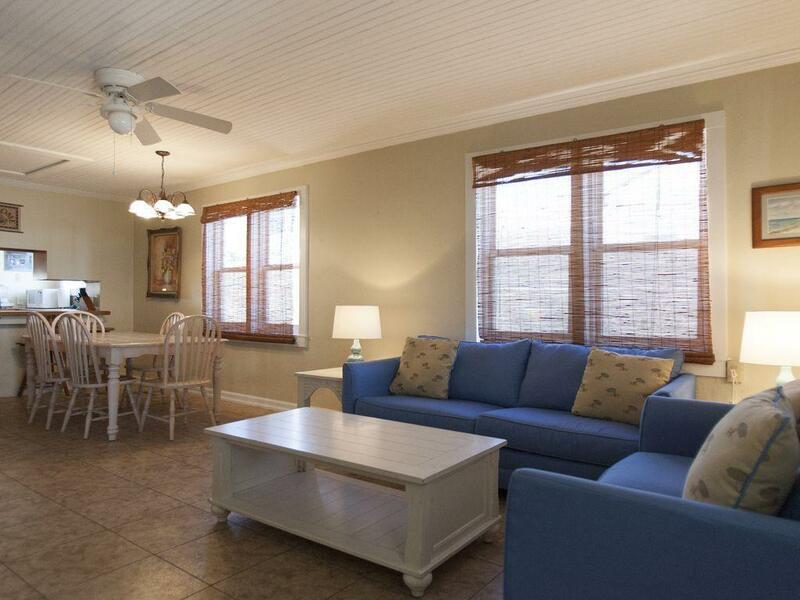 We really enjoyed our week and would not hesitate to rent this property again!! 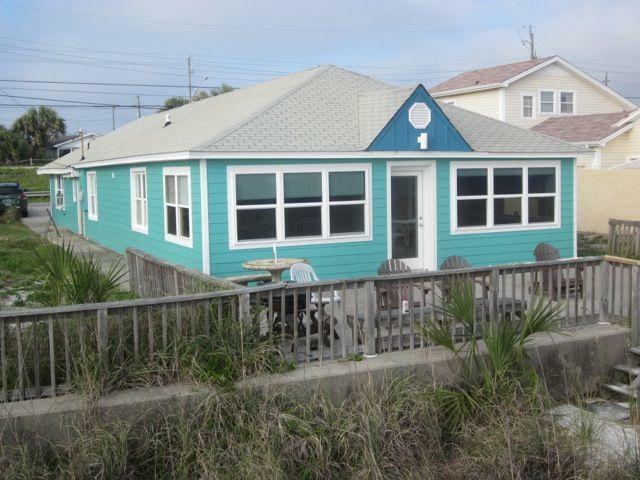 Property is located right on the beach. Very well taken care of for as rustic as the house is. 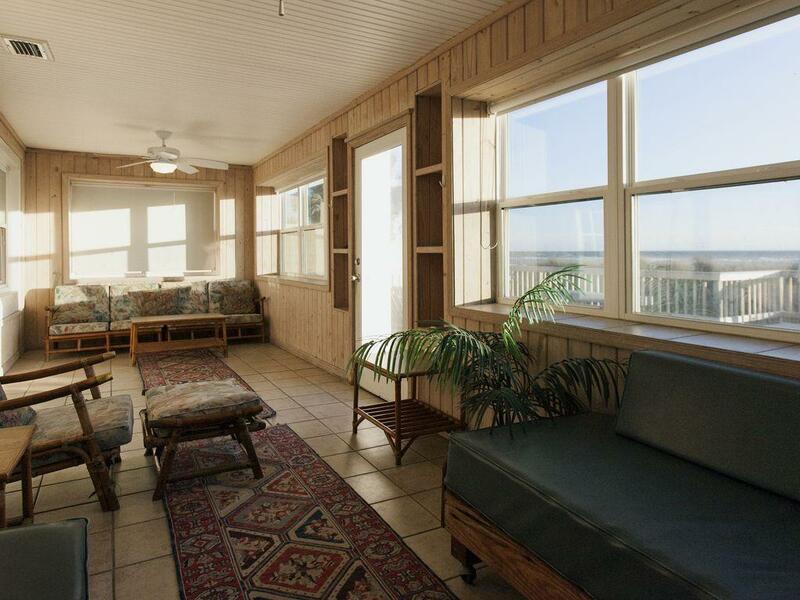 Don’t hesitate to rent this house if you're looking to relax at the beach. Great Beach House! Nothing fancy, but definitely everything you need for an Awesome Beach Getaway! Love this place! 3rd time here Will be back! The home was comfortable and fit our needs. Very professional and friendly. Would def rent this property again! 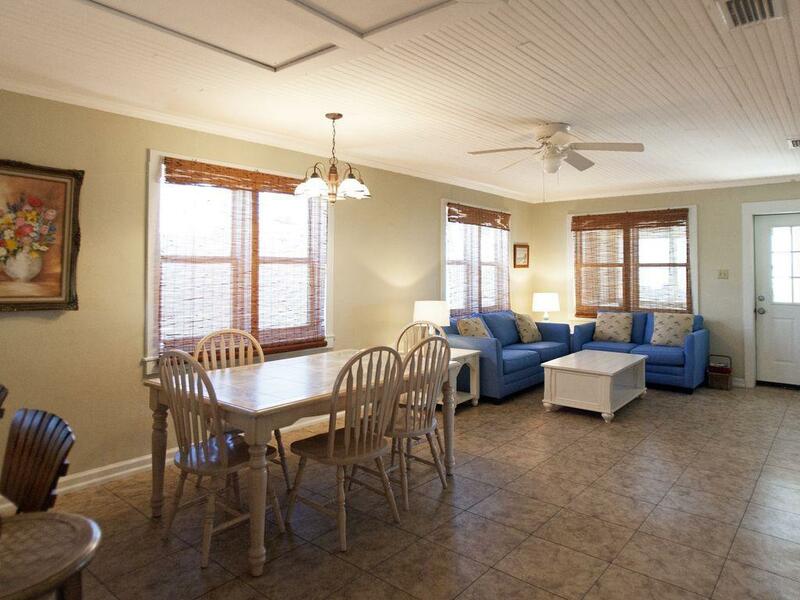 The best thing about this house, IT'S ON THE BEACH!!!!!! This house was amazing!!! Our family stayed here for Thanksgiving after our original reservation was double booked. The host were amazing in responding to us quickly. Otherwise, our family would have been stranded with nowhere to have Thanksgiving. This turned out to be a much better house than we had chosen....beach literally at the back door. We spent mornings, afternoons, and evenings enjoying the spectacular view.  We even ate our Thanksgiving meal on the back deck, Gulfside Thanksgiving meal...we will definitely be repeating visits to this house. Absolutely Wonderful!!! House was very well maintained for as rustic as it is. But overall we will stay there again. We really enjoyed our stay at The Outpost. It was very convenient and well set up. Being directly on the beach was amazing. One of our party is going to book the place for her family later in the summer. We will definitely be returning. We loved staying at this house. My husband slept in enclosed porch the whole week which he loved! Also worked out for my friends Dad who had to be on crutches or in a wheel chair! He was able to use sidewalk along the side of the house to get to the patio. Plenty of room to sleep. The kitchen is small but worked out just fine, did not need a huge one. You can tell it’s an old house but very well maintained. We will definitely rent this house again. 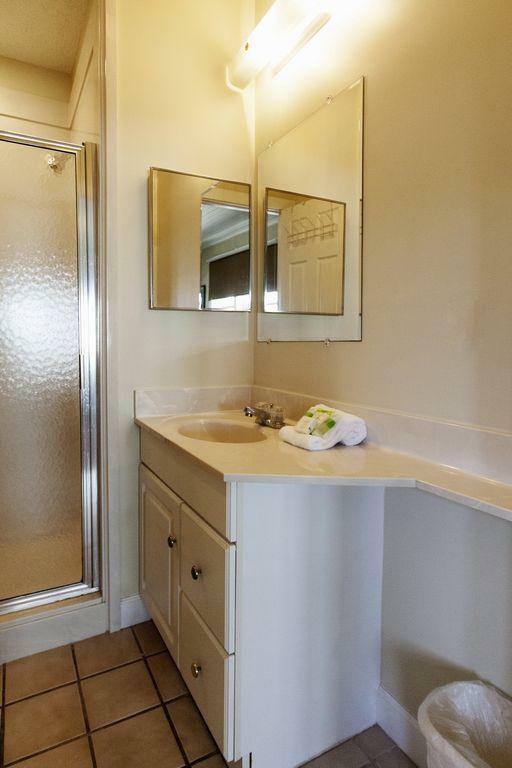 The house is spacious and well-equipped. We especially enjoyed the terrace with this beautiful view! The agency took great care of us, also in connection with the critical weather situation. We would all definitely like to come back to the Outpost! We loved our stay at the Outpost. We loved the quaintness of the neighborhood but still was able to enjoyed the night life of the Panama City Beach strip. If there was anything I would change, it would be the extremely hard mattress in the master bedroom. That's just my preference though. We will definitely be back next year. The Outpost had everything we needed for our vacation needs..Plenty of room for the nine adults and a 10-month-old infant..Quick access to the beach, restaurants, and entertainment! 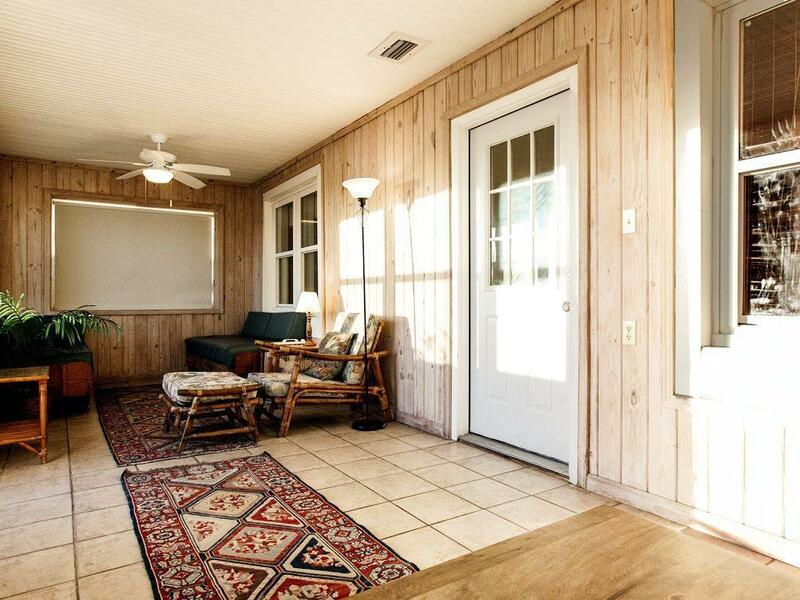 We would definitely rent this home again! Really enjoyed staying very family friendly. We will be going back again. We'd be happy to check availability for you. Not the one for you? Search more rentals!